Just a few days before the Minnesota Attorney General primary, a Minnesotan environmental activist and her son have accused Representative Keith Ellison of physical and psychological abuse. On August 11, Austin Aslim Monahan published a note on Facebook claiming that he had found a video of Ellison dragging his mother, Karen Monahan, off a bed while screaming profanities at her. 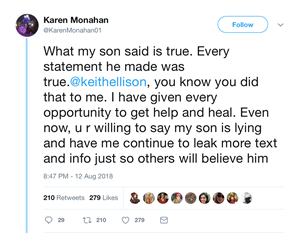 Karen Monahan has since declared her son's account to be true. The video referred to by Austin Monahan has not been published. Keith Ellison's campaign, meanwhile, has released a statement denying the abuse: "This video does not exist because I never behaved in this way, and any characterization otherwise is false." Ellison has repeatedly supported legislation tackling the problem of domestic abuse in the past. In 2012, Ellison even attacked his Republican opponent's martial history during a heated debate, stating: "You're really stupid for bringing up your domestic violence charges." However, Ellison, who is also deputy-chair of the Democratic National Committee and candidate for Minnesota Attorney General, has a long history of Islamist links. He has repeatedly shared stages with hardline clerics who justify domestic abuse. In 2012, for example, Ellison joined Muslim Brotherhood cleric Jamal Badawi at an event organized by the Islamic Society of North America. Badawi has told husbands they may strike disobedient wives "in the cases of lewdness on the part of the wife or extreme refraction and rejection of the husband's reasonable requests on a consistent basis." With just a few days before the primary, it remains to be seen how much of an effect these allegations will have on Ellison's campaign to become Minnesota's next Attorney General, in which he is the front-runner. If the alleged video of Ellison is released, the Democratic deputy-chair may be facing a very bleak future indeed.